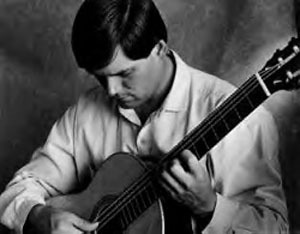 At David Levin Entertainment, we offer the very best in classical ensembles including Los Angeles string ensembles, San Francisco Bay Area string ensembles and solo artists (flamenco guitarists, harpists, pianists, etc.) as well as the top string ensembles in Texas. We also provide outstanding solo artists such as pianists, guitarists and harpists. 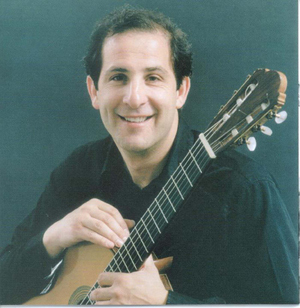 We are the exclusive agent for Modern Classical concert guitarist, Lawrence Ferrara for corporate events and weddings. The DLE Northern California Concert Harpists are outstanding and have been with us since DLE began. Both are Symphony harpists and both are a joy to work with. 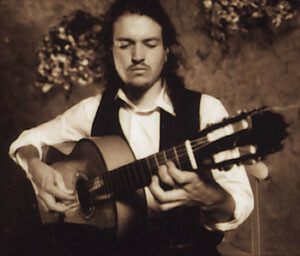 The DLE Flamenco Guitarist has wowed our clients for many years and studied with the greats in Spain. Our Northern California String Ensemble has been with us for many years and has performed for many DLE wedding clients at Napa-Sonoma wineries and other wedding sites. 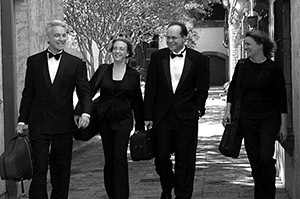 The DLE L.A. SQ are fabulous symphony musicians who’ve done weddings for our clients in Beverly Hills and surrounding areas in Southern California. All of these groups are available across the U.S.
Our symphony-level Classical artists travel anywhere in the U.S. as well as internationally. 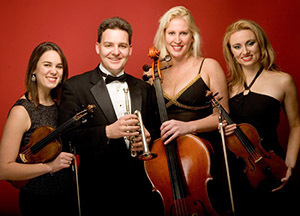 We also feature outstanding classical ensembles based in Las Vegas for corporate events and weddings. These groups are not seen on this page but are available to our clients. Most of these groups feature "electric strings" and can provide full video performances on stage. Please ask about promotional videos of our ensembles that can be seen online. Our ensembles can go out as duos (two violins, violin and cello or violin and flute), trios, quartets and quintets (string quartets with harpists). We feature select strolling strings should our clients request strolling (which is very popular in San Francisco). Quality strolling musicians are rate and we have the best! David Levin Entertainment has contracted classical groups since our company began in 1998. The DLE L.A. SQ is a Symphony level ensemble of experienced professional musicians who play just about every style of music. DLE is proud to offer this outstanding L.A.-based ensemble to our Southern California wedding clients. The DLE Northern California String Ensemble is an assemblage of the finest string musicians in Northern California. They have years performing music for wedding ceremonies and receptions and play a wide variety of music from classical to show tunes to pop. You will hear their string duo, trio and quartet tracks below. 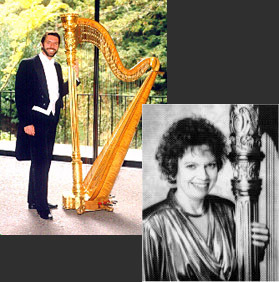 The DLE Northern California Concert Harpists have years of Symphony and concert harp performance between them, as well as many years of wedding ceremony and reception performance experience. Two of the best are featured here. The mp3 tracks below feature the male harpist in the photo.